Thai Airways is ranked #4 in the Skytrax best airlines list and it really deserves it. 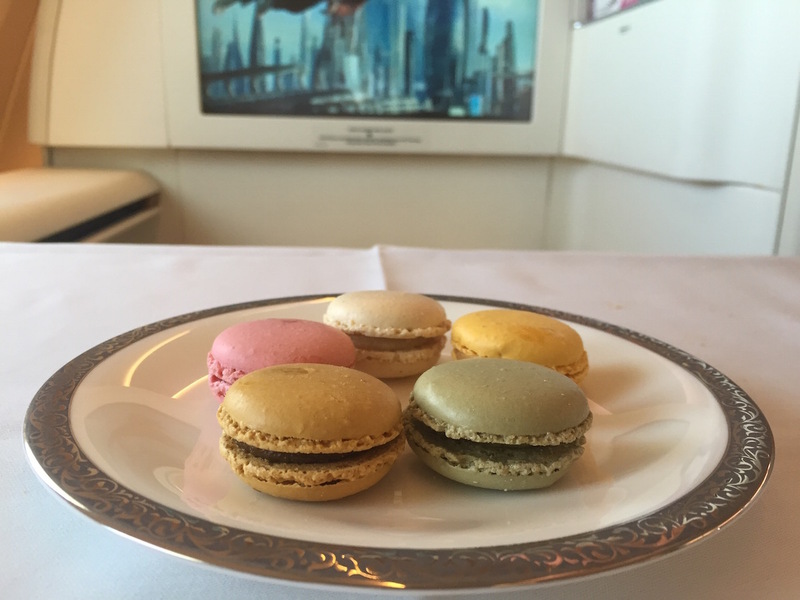 The A380 in-flight service is absolutely stunning – thanks to a very efficient crew – and it makes the Royal First Class an unforgettable journey experience. it definitely worth the Star Alliance miles upgrade spending! Let’s say it frankly and straight to the point: Thai Airways A380 Royal First Class offers an absolutely stunning flight experience and is for sure one of the best we ever had. We already flew in their B777 configuration in the past – which was our for sure very good – but the A380 is something more magical… More space, more services, more exclusive! 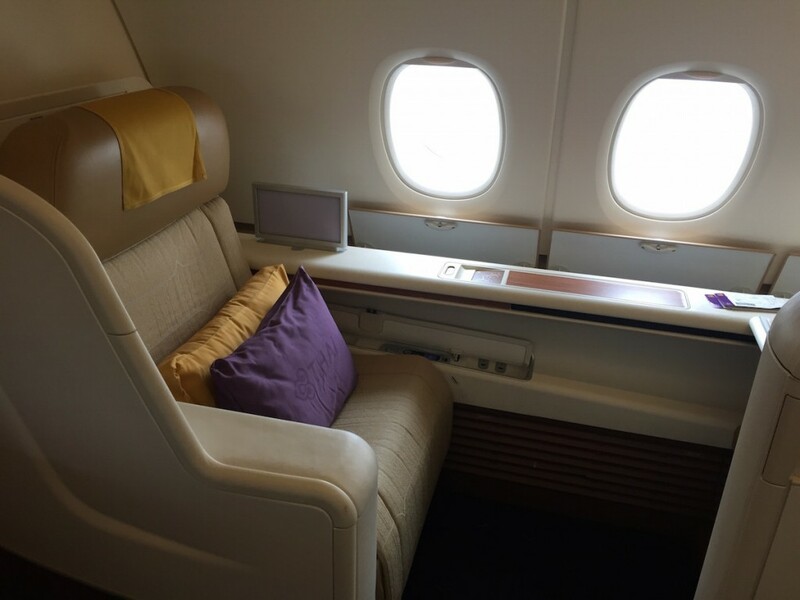 The Thai Airways A380 Royal First Class 1-2-1 seat’s configuration is brand new – the aircraft has been released some months ago on Paris line – so everything looks good and the overall layout, 12 seats, is efficient. Color tones are soft and zen while the seat itself is quite good with nice materials ; to be honest I regret a bit the sliding doors and the privacy I had in the B777 First cabin. Anyway, I quickly forgot it and spent a wonderful journey with a deep sleep thanks to the comfy 180° full flat bed. I especially liked the moving shelf that you can pull to enjoy meals during lunch/dinner and push back below the screen to put things/handbag ; very convenient and it’s the first time I see this kind of trick. Thai Airways A380 catering is faultless, there is no difference with a fine-dining restaurant. The caviar trolley is a must-see and all appetizers, main dishes, cheeses and desserts are very tasty ; we enjoyed caviar, foie-gras on gingerbread, a confit duck and a selection of macarons… Can you believe it ?! 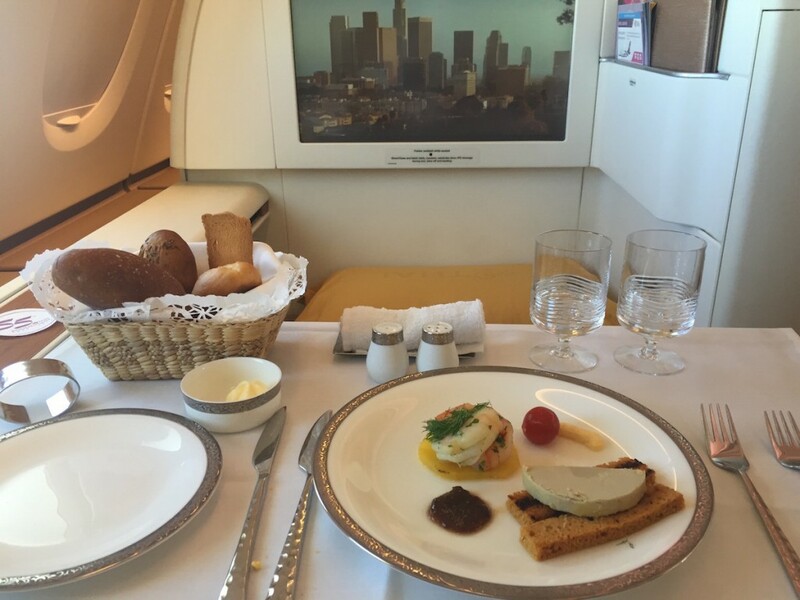 Even plates and cutlery are quite an experience – I am fan of the plates decoration – and this achieves to turn a Thai Aiways A380 Royal First Class in-flight lunch into a 3 Michelin-star restaurant degustation. CDG to BKK, night flight on A380 in August 2015.